In order to be truly worth its salt, a self-defense round must be able to deliver knock-down performance under any circumstances -- as a rule, your assailant will not plan his attack when all the cards are stacked in your favor. 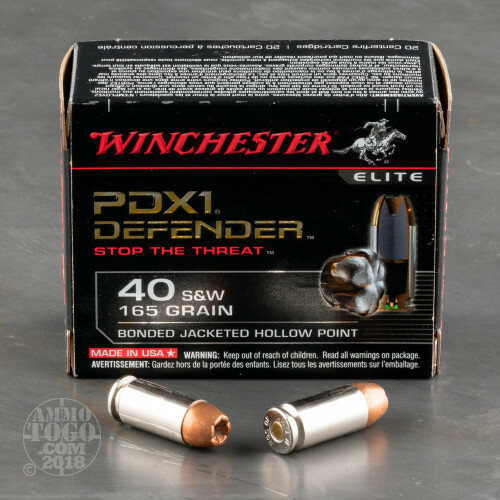 That’s why this 40 S&W cartridge from Winchester’s Defender line of ammunition has a slew of features to ensure your safety during a precarious altercation. Its brass casing is nickel plated, so it will cycle efficiently through a semi-automatic weapon and further stave off the corrosion brought about by exposure to atmospheric moisture. Its sensitive primer is non-corrosive, and its propellant burns clean so that heavy residue accumulation will not impact your weapon’s accuracy. It’s this round’s bullet that truly sets it head and shoulders above the rest, however. The PDX1’s jacket and core are welded together, so it is able to retain its weight for deep penetration even after having passed through media such as auto glass, plywood, and winter clothing. 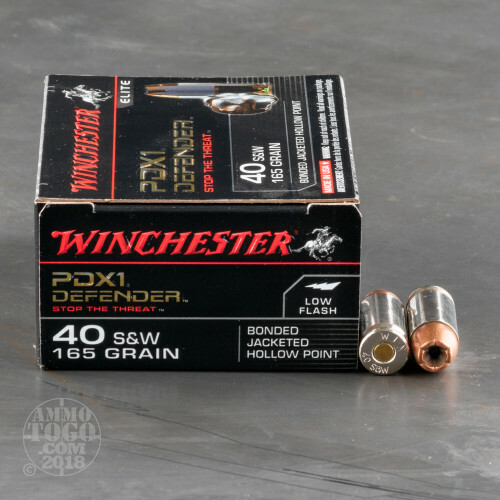 The PDX1 is able to expand reliably owing to the notches cut into the tip of its hollow point cavity, and that it consistently widens up to 1.5 times its original diameter makes its terminal performance indisputably devastating. Try this round for yourself and you won’t wonder why FBI agents favor it in the course of their dangerous line of work. 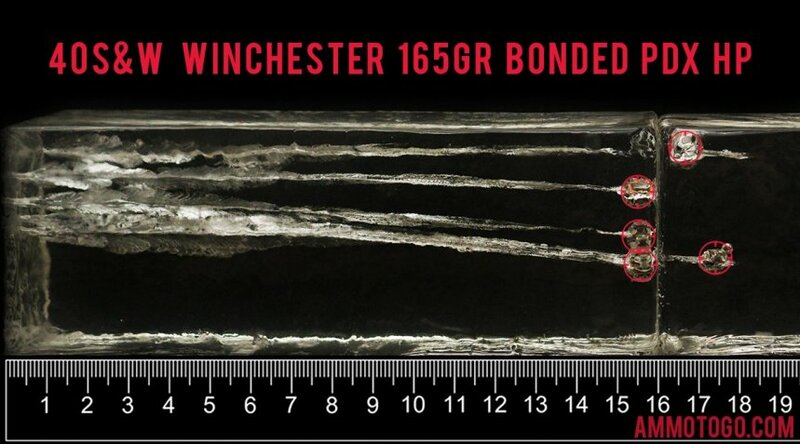 We fired five rounds of this Winchester Ammunition 40 Smith & Wesson ammo through a cloth barrier into Clear Ballistics calibrated synthetic gelatin and recorded the results. For these tests, we used a S&W M&P40c with a 3.5-inch barrel. In the photos, graphics and video on this page, you can see specifically how the Winchester Ammunition ammo performed and how it sticks up with the rest of the 40 Smith & Wesson ammo we have tested so far. 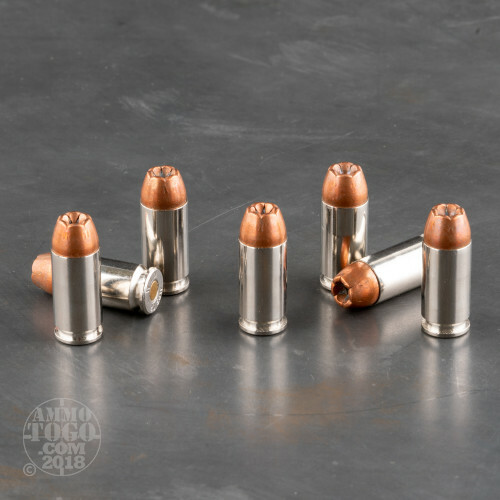 Expansion Diameter Compared to All 40 Smith & Wesson Ammo Tested MIN 0.39" MEDIAN 0.65" THIS AMMO 0.71" U.S. dime MAX 0.89"
Penetration Depth Compared to 40 Smith & Wesson Tested 0" 10" 20" 30" MIN 9.8" MEDIAN 16.5" THIS AMMO 16" MAX 32"
This is a excellent duty round for Law Enforcement, or a Personal defense round. Hard hitting and great expansion. So far this is my favorite round other than the 180 gr variety of this round. It has great penetration and expands reliably. It's firm on recoil and worth the price if you can't find ranger bonded packs. I just received my ammo in both .40 and 9mm...the the .40 ammo were in excellent condition, but the 9mm rounds had stained green looking mildew on actual bullets. I just hope this matter can be resolved and my future order of 9mm ammo will arrive in better condition. 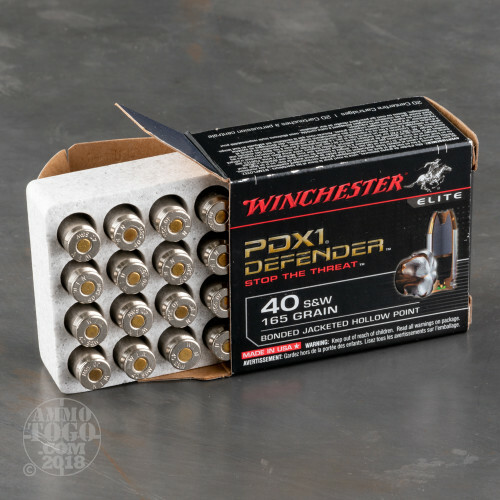 I would expect more being they are Winchester Supreme Elite PDX1 ammo at $20 a box. Again the .40 ammo was EXCELLENT it's the 9mm that need to be better packaged or stored.